Taiwan's Computex is the show to be at if you want to see the latest and greatest notebooks and Asus hasn't disappointed us with its latest ZenBook. 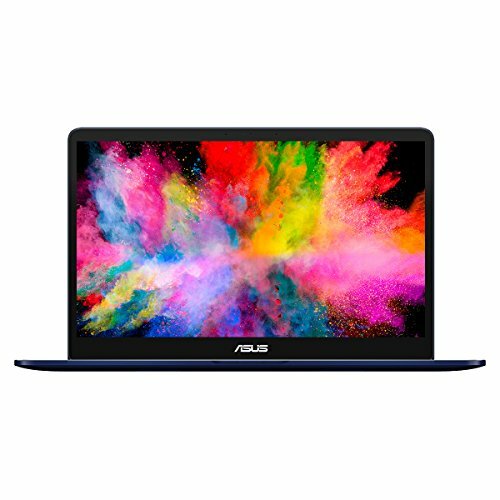 The Asus ZenBook Pro 15 is a device clearly made with creatives in mind and, as we’ve come to expect from Asus at this time of year, it comes with an inventive trick up its sleeve: a Full HD auxiliary touchscreen in the touchpad. Pocket-lint had an opportunity to have a play around with it and we are happy to say that it lives up to its promise. The laptop runs on 8th generation six-core Intel i9 processor and has 16GB of RAM, Nvidia GeForce GTX 1050 Ti graphics and a 1TB PClex4 SSD. It has a 4K display, but it's actually possible to have four different auxiliary displays all running Ultra HD visuals. With these kind of capabilities it is clear that Asus is aiming for users that work with video, photography and 3D design. A MacBook Pro replacement basically. The 5.5-inch ScreenPad sits happily below the keyboard and Asus has several suggestions as to how it can be utilised. For example, you can sync it with your phone, or run secondary displays (it can even be split screen). It is a size that smartphone users are accustomed to and, indeed, it feels perfectly natural to use, even to play music or simply keeping an eye on chat or notifications while you work. It was cheekily suggested in our private briefing that it was a particularly handy way to appear to be fully absorbed in your work while having half an eye on your social media accounts. However, the ScreenPad is much more than a handy way to slack off. Users can also pull up the number pad on the screen, which is often missed when working on a reduced size laptop keyboard. Or you can have the calculator to hand and even have the taskbar from Powerpoint or Excel running. Any app that is downloaded on the ZenBook can also be customised and added to the apps list on the homescreen of the ScreenPad too. In practice, the ScreenPad was responsive and easy to use and we can imagine that once you get used to having that extra screen literally at your fingertips it will become so natural that you’d be trying to pull it up on other devices’ touchpads too. As with other ZenBooks, the Pro 15 is beauty to look at. It is rendered in dusky blue with a concentric brushed aluminium lid and rose-gold trim. The usual ports are on hand with USB 3.1 Gen 2 Type-C with Thunderbolt 3, USB Type-A and standard HDMI ports, plus 802.11ac gigabit-class Wi-Fi. Users can use Windows Hello or Alexa to access and control the device, thanks to facial, voice and fingerprint recognition capabilities. The 15-inch NanoEdge 4K UHD touchscreen is glorious with super slim bezels. We observed a live demo of the Delta-E value coming in at well under two, which means that photographers and graphic designers can rest assured that they are dealing with a level of colour difference that is undetectable to the human eye. That isalso backed up by the endorsement from Pantone. With the connectivity, sheer power and colour veracity it’s reasonable to expect that the higher spec models will appeal to creative professionals. Certainly, with an expected price tag of around £2,200 it’s likely that this is going to be the case. For those who can’t write it off as a business expense, perhaps the i7 version (16GB RAM/ 512GB PCl) might be a better bet at around £1,900. Whichever you choose, the Asus ZenBook Pro 15 is slated for release in September.